Recently I noted in a post three digitized manuscripts at Brussels with texts concerning or relating to law, in order to include the digitized armorial Brussels, Bibliothèque Royale, ms. IV 1249, written in the first quarter of the fifteenth century. An armorial is a book showing the heraldic arms or blazons of a particular knightly order, for a particular occasion or region. Since I also noted the digitized version of the Grand Armorial de l’Ordre de la Toison d’Or at Paris (Bibliothèque nationale de France, ms. Arsenal 4790) it crossed my mind to look for more digitized medieval manuscripts with armorials, and to connect them with medieval law. The Order of the Golden Fleece will serve here as the main example. The Dutch Royal Library has digitized the Wapenboek Beyeren (The Hague, KB, ms. 79 K 21) written in 1405. You can find images and description of more armorials kept at The Hague at the manuscript website of the Dutch Royal Library. 128 E 20 is an armorial for France and the Southern Low Countries, and 76 E 4 is another armorial, from 1601, for the Order of the Golden Fleece. At the Museum Meermanno-Westreenianum in The Hague is ms. 10 F 7, an Armorial des Chevaliers de la Table Ronde, on which the museum’s manuscript catalogue gives further information, but you can view it at the Royal Library’s manuscript site. On Gallica you will find only a number of digitized manuscripts with early modern armorials at the Bibliothèque nationale de France, but it is more sensible to use the Mandragore database for its illuminated medieval manuscripts. A first search for armorials yields 18 results. To put these results in a perspective, so far the British Library has not yet made accessible any medieval armorial among its digitized manuscripts. Using the advanced search interface I found three armorials, an armorial for members of the Order of the Garter from 1588 (Harley 1864), an armorial with also statutes for the Chevaliers de la Table Ronde de Bourges, written between 1486 and 1533 (Harley 5301), and Harley 6199, Statuts de l’Ordre de la Toison d’Or, written in Bruges between 1481 and 1486. For each manuscript the British Library shows a number of images. Finding a manuscript with the title Statutes in a search for armorials made me of course wonder whether this manuscript in fact does qualify as an armorial, and it brings me to a subject a bit closer to legal history, the statutes of knightly orders. 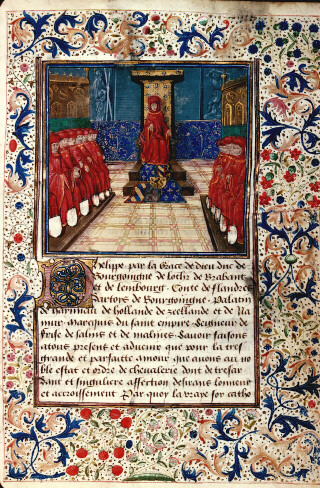 According to the catalogue record Harley 6199 is the oldest known manuscript with the statutes of the prestigious Order of the Golden Fleece founded in 1430 by duke Philip the Good of Burgundy. I tried to find more about Harley 6199 with the various search options of the manuscript catalogue, but the manuscript did not show at all. The description of Harley 6199 in the BL’s illuminated manuscript catalogue mentions the term armorial only in the description of its binding (!) and in the title of an article concerning this manuscript. The description of the content tells you not exactly where the statutes start and end, only that from fol. 59 onwards of the 77 leaves the arms of the members of the Order are depicted. Luckily the description goes with solid references to publications about the manuscript. The status of Harley 6199 as an illuminated armorial is confirmed in the database Luxury Bound of Hanno Wijsman (Leiden). In his project on illuminated manuscripts from the Netherlands between 1400 and 1550 Wijsman found some 3,700 manuscripts. Thanks to his database you can quickly find more armorials of the Order of the Golden Fleece, and you will find which armorials contain also the statutes of this chivalric order, apart from Harley 6199 also Aylesbury, Waddesdon Manor, James A. de Rothschild Collection 17, The Hague, Royal Library, 76 E 10, and Vienna, Österreichische Nationalbibliothek, 2606. You can check here, too, for the earliest copy of the statutes of the Order of the Golden Fleece. The British Library probably has in mind the earliest illuminated copy, but anyway in Luxury Bound the manuscripts Besançon, Bibliothèque municipale, Chifflet 91, written between 1473 and 1480, once owned by Lodewijk van Gruuthuse, and The Hague, KB, 76 E 10, written between 1473 and 1478, are earlier than Harley 6199. For a really early manuscript with the statutes of the Order of the Golden Fleece a manuscript such as The Hague, KB, 76 E 14, found in the database Medieval Manuscripts in Dutch Collections. written between 1431 and 1446, comes a lot closer to the claim of being the first surviving textual witness. The French website Enluminures will bring you to further illuminated manuscripts with these statutes, apart from the Besançon manuscript also Valenciennes, Bibliothèque Municipale, 803. More information on the manuscripts of the earliest statutes of the Order of the Golden Fleece and a modern edition of them is to be found in Sonja Dünnebeil (ed. ), Die Protokollbücher des Ordens vom goldenen Vlies,1 : Herzog Philipp der Gute 1430-1467 (…) (Stuttgart 2002). The statutes of the Ordre de Saint-Michel are the subject of a fine blog post by Jean-Luc Deuffic. Much more armorials are to be found in Munich. The Bayerische Staatsbibliothek has digitized in the project BSB-Codicon Online some 150 armorials and other illustrated heraldic manuscripts in the Codices iconographici collection. This collection starts with the late Middle Ages and contains manuscripts up to the late nineteenth century. Karen Larsdatter has published on her website a page with a very generous selection of digitized medieval rolls of arms, armorials written on parchment rolls, and she mentions some of these Munich manuscripts. At Zurich yet another roll of arms has recently been digitized, like other rolls at Zurich called the Zürcher Wappenrolle. This roll is kept at the Schweizerisches Nationalmuseum, sigature AG 2760 (around 1330-1345). Some manuscripts with the texts of Bartolus’ treatise have been digitized. Wolfenbüttel, Herzog-August-Bibliothek, Cod. Guelf. 167 Helmst., fol. 159r-162r (sigle Wa in the 1994 edition) can be read online. This manuscript was written around 1420. Tübingen, Universitätsbibliothek, Mc 58, fol. 131v-137v, is another example, written between 1461 and 1463. Of the manuscript Greifswald, Geistliches Ministerium Greifswald, ms. 10.B.V., fol. 259r-262v, written between 1474 and 1476, you can see photographs in black and white at the German website Manuscripta Medievalia, and this permalink brings you quickly to them. At the Digital Scriptorium, this month still accessible at Columbia University, but soon coming back to Berkeley at the original web address to be maintained by the Bancroft Library, you will find the manuscript Berkeley, Ca., The Robbins Collection, ms. 225, fol. 205v-208r, with images. At fol. 208r another treatise by Bartolus starts, his De tyranno, which ends on the verso folio at the fourth image, and this information is not included in the description. The first half of the manuscript catalogue (ms. 1-120) of The Robbins Collection can be consulted online. Incidentally the study by Cavallar, Kirshner and Lepsius was published by this library. The two manuscripts with Bartolus’ text in the holding of The Robbins Collection, ms. 225 and ms. 148, f. 257r-262r – also described at the Digital Scriptorium – are not mentioned in their study. Ms. 225 was only acquired by the library in 1994. In view of the massive amount of manuscripts and books digitized at Munich it is no surprise to find at least one digitized manuscript with Bartolus’ treatise, Munich, Bayerische Staatsbibliothek, Clm 14134, fol. 156r-158v (images 317 to 322). The images seem to stem from a microfilm of this manuscript. The manuscript tradition of De insigniis et armis is rather extensive. In his article on Bartolus de Saxoferrato from 1964 for the Dizionario Biografico degli Italiani Francesco Calasso listed already some seventy manuscripts. Some of them merit closer inspection. The description of ms. O.2.35, fol. 97r-103r, by M.R. James in his catalogue of manuscripts at Cambridge, Trinity College – available online – says that fol. 97r is decorated with a shield “or a chevron gu. between three martlets sable“. It is a nice heraldic exercise to establish the exact form of these arms, gold with a red (gueules) chevron between three black (sable) martlets, stylized birds. No doubt someone more versed in heraldry can tell to whom these arms belonged. Many manuscripts with this treatise first published in 1358 stem only from the fifteenth century. It is rare to find earlier manuscripts. Nuremberg, Stadtbibliothek, Cent. IV 54, fol. 442r-447r – sigle Na in the 1994 edition – was written in Pistoia in 1384. Basel, Universitätsbibliothek, C II 15, fol. 60r-6rv was written between 1376 and 1381, and Klosterneuburg, Stiftsbibliothek, 194, fol. 135va-140r, was written at this Austrian monastery between 1395 and 1399. The manuscript London, British Library, Add. 8719, has a flyleaf from the fourteenth century with a fragment of Bartolus’ text. In the Verzeichnis der Handschriften zum römischen Recht bis 1600 (4 vol., Frankfurt am Main 1972) Gero Dolezalek and Hans van de Wouw listed more than hundred manuscripts which according to manuscript catalogues contain this text of Bartolus. Some of these manuscripts have been lost by fire or cannot be found anymore after the Second World War, or the attribution is doubtful. Susanne Lepsius studied and edited another treatise by Bartolus, the Tractatus testimoniorum, in Der Richter und die Zeugen [The judge and the witnesses] (Frankfurt am Main 2003). She noted that Bartolus’ treatise is easily the most widespread of his treatises, and that it is probably the most often copied medieval legal treatise. For me the very low number of fourteenth-century manuscripts is puzzling. Instead of creating a much longer post with too much manuscripts it is just as useful to give more indications of the road to them. Hanno Wijsman’s database Luxury Bound guides you to illuminated manuscripts from the Burgundian Low Countries, and the Verzeichnis by Dolezalek and Van de Wouw is indispensable in finding medieval legal manuscripts. For Bartolus manuscripts in Spanish and Italian libraries have been tracked down and described by Emanuele Casamassima and Antonio García y García in Codices operum Bartoli a Saxoferrato recensiti, part I, Iter Italicum, and part II, Iter Hispanicum (2 vol., Florence 1971-1973). Thomas Izbicki and Patrick Lally have followed their footsteps in ‘Texts attributed to Bartolus de Saxoferrato in North American manuscript collections’, Manuscripta 35 (1991) 146-155. More repertories of medieval legal manuscripts do exist, for example in the field of medieval Roman law the Repertorium manuscriptorum veterum Codicis Justiniani, Gero Dolezalek and Laurent Mayali (eds.) (2 vol., Frankfurt am Main 1985), for German customary law Deutsche Rechtsbücher des Mittelalters, Ulrich-Dieter Oppitz (ed.) (3 vol., Cologne 1990-1992), and for medieval canon law in particular A catalogue of canon and Roman law manuscripts in the Vatican Library, of which sofar two volumes have appeared, edited by Stephan Kuttner and Reinhard Elze (Città del Vaticano 1986-1987). It is certainly possible to expand this paragraph, but these studies cover much. You can find online information on manuscripts with texts concerning medieval canon law in the lists created by Gero Dolezalek and Giovanna Murano. Brendan McManus, too, provides useful additional information in his manuscript lists. Among the links provided by Dolezalek is the database of microfilms and CD-ROM kept at the Sezione di Storia del Diritto medievale e moderno in Milan. Microfilms of medieval legal manuscripts can also be consulted at Munich and Frankfurt am Main. Those wanting to pursue the history of heraldry will benefit from the Bibliographie héraldique internationale compiled by Michel Popoff. The analysis by Cavallar, Kirshner and Lepsius makes it crystal clear how Bartolus’ approach did not focus only on heraldic arms, but on any sign or mark people might use. Thus he could include a discussion of the trade marks used by artisans and merchants. Bartolus did not only look at knights and noble people, but looked first and foremost on city life in Tuscan towns which had and have connections with towns all over Europe. The three authors rightly warn us not look at medieval legal treatises in isolation. In the case of Bartolus it is far more interesting to relate his views on particular subjects to his main commentaries, and to make comparisons between his treatises, a path masterfully shown by Diego Quaglioni in his study Politica e diritto nel Trecento italiano (Florence 1983) with editions of three treatises on political themes by Bartolus. In this post you find just some aspects of larger issues which deserve further study. I am happy to share here some fragments from a virtual workbench, and to point you to the works of some leading scholars in the field of late medieval law. At his blog Archivalia Klaus Graf alerts to the online version of the study by Sonja Dünnebeil at Prosopographica Burgundica, a site with a digital library for the history of the Burgundian court, a database on the personnel of this court as indicated in the ordonnances d’hôtel, and also a database on Burgundian heralds. Graf points to a very recent study by Torsten Hiltmann, Spätmittelalterliche Heroldskompendien. Referenzen adliger Wissenschaft im Zeitalter gesellschaftlichen Wandels (Munich 2011). Hiltmann has built Prosopographica Burgundica, an initiative of Werner Paravacini and the Deutsches Historisches Institut in Paris. If you want to look at websites about medieval heraldry you will find the selection and comments at the relevant pages of the Virtual Library Historische Hilfswissenschaften in Munich most useful. This Virtual Library for the historical auxiliary sciences – in German or English – is a classic website for medievalists. Since July 2012 you can search the Verzeichnis of Dolezalek and Van de Wouw online at the website of the Max-Planck-Institut für europäische Rechtsgeschichte in Frankfurt am Main. A final addition: news about research on medieval heraldry can be conveniently found at the Heraldica Nova blog maintained by Torsten Hiltmann (Münster), with an overview of digitized armorials from the thirteenth to the sixteenth century, with for example Kassel, UB, 4 Ms. Hist. 4, another manuscript with the statutes of the Order of the Golden Fleece.. For an overview of medieval armorials and available editions you should visit the website of Steen Clemmensen. 1. Osvaldo Cavallar and Julius Kirshner, ‘”Ne ultra scarpas”. Un cultore d’araldica fuorilegge”, Ius Commune 27 (2001) 297-311 – this review of the edition by Mario Cignoni (Florence 1998) is available online. 2. Gustav A. Seyler, ‘Domini Bartoli de Saxoferrato Legum doctoris Tractatus de insigniis et armis’, Viertelsjahrschrift für Heraldik, Sphragistik und Genealogie 7 (1879) 268-283. 3. Jesús D. Rodriguez Velasco, ‘El “Tractatus de insigniis et armis” de Bartolo y su influencia in Europa (con la edición de un traducción in castelllana cuatrocentista)’, Emblemata. Revista aragonesa de emblemática 2 (1996) 35-70. This entry was posted in Manuscripts and tagged Digital libraries, Heraldry, Illuminated manuscripts, Knightly orders, Medieval law on January 26, 2012 by rechtsgeschiedenis.